These spicy wings make a great snack. In a bowl, combine the marinade ingredients and add the mid-wings. Toss to coat well and set aside in the fridge for at least an hour. Combine the batter ingredients in a mixing bowl. Set aside to rest for at least 10-15 minutes. Dip the marinated chicken wings in the batter. Deep fry in hot oil over medium low heat for 5-6 minutes. Remove from oil and drain. Reheat the oil until hot over medium to high heat. 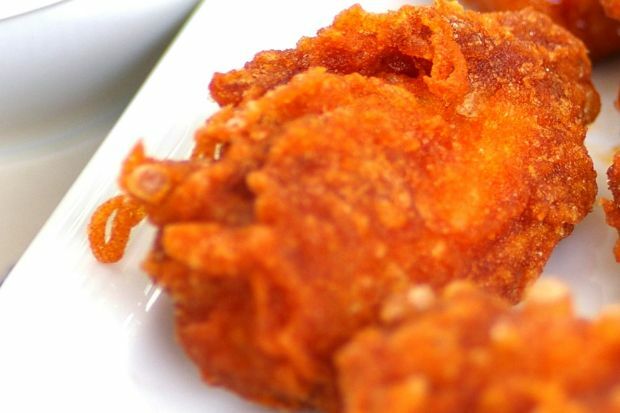 Dip the fried chicken wings in the batter again and refry for 2-3 minutes, or until golden brown and cooked through. For the onion pickleCut the onions into half then slice thinly. In a bowl, combine the onion, sugar, salt and vinegar. Steep for about 20 minutes. Stir in beetroot juice. Toss briefly then set aside for 5-10 minutes before serving.